Influential guilds and patricians dominate city life, and everybody of distinction meets around the cathedral. The construction of the cathedral has not yet been completed, but the city is already prosperous and prestigious. At these exciting and eventful times, who will optimally handle their business ventures and go down in the annals of the city's history as an important citizen? The simple basic mechanism of the game - push in 1 action tile and carry out the 3 associated actions - makes for constantly changing possibilities. 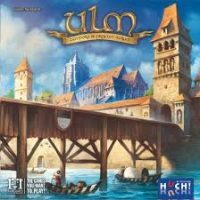 Add a Review for "Ulm"